The classic VIPER wide angle sunglasses gives you complete surround sound vision... with UV and blue light protection for the ultimate in style and light spectrum filtration. World Famous BLUBLOCKER® sunglasses are made of tough , clear Malenium, a lens that provides exceptional vision and clarity! 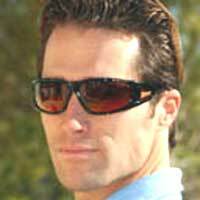 BluBlockers also use a special form of nylon material with "memory retention" which makes the frame flex back into its original position after deflection. BluBlockers® adjust to weather conditions and their special light-weight nylon frame construction makes them suitable for all size faces. Without a doubt, they are the finest pair of sunglasses you can buy for lens quality, frame construction and comfort. Quality padded carrying case is included! Backed with a Manufacturer’s Lifetime Replacement Program!